Illegal methamphetamine "cooks" are traipsing undetected through an unknown number of motels and hotels with covert drug-making labs — leaving a toxic mess behind for unsuspecting customers and housekeeping crews. They are places where drug-makers can go unnoticed, mixing the chemicals needed for the highly addictive stimulant in a matter of hours before slipping out the next morning. The dangerous contaminants can lurk on countertops, carpets and bathtubs, and the sickening smells produced can be masked by tobacco smoke and other scents. Motels can be an attractive alternative for drug makers seeking to avoid a police bust in their own homes. "They can seize the trailer or seize your house but they can't seize a motel room," said Dr. Sullivan Smith, director of emergency services at Cookeville Regional Medical Center in north-central Tennessee. U.S. Drug Enforcement Administration records obtained by The Associated Press show that states reported finding drug-making in 1,789 motel and hotel rooms in the past five years — and that's just what authorities found. Some cleanup professionals hired to make the travelers' havens livable again say most of their work is done on properties where a meth lab was discovered long afterward. The number of clandestine labs that are never found is difficult to pin down. There was a slight uptick in hotel and motel lab busts reported to the Drug Enforcement Administration in 2008 from the previous year, with 149 in 2006, 87 in 2007 and 127 in 2008. The tally was 461 in 2005 and 965 in 2004, before there were restrictions on purchasing over-the-counter decongestants often used as ingredients. The DEA count is based on states that reported labs. 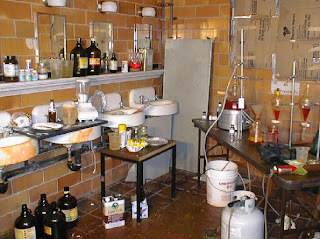 The toxins can linger for days if meth lab hygienists wearing hazmat suits don't clean living areas. The cleanups cost anywhere from $2,000 to $20,000. Even short-term exposure to vapors and residue where the drug is smoked or cooked can cause eye and skin irritation, vomiting, rashes, asthma problems and other respiratory issues.